A mixed graph G can contain both (undirected) edges and arcs (directed edges). Here we derive an improved Moore-like bound for the maximum number of vertices of a mixed graph with diameter at least three. Moreover, a complete enumeration of all optimal (1, 1)-regular mixed graphs with diameter three is presented, so proving that, in general, the proposed bound cannot be improved. 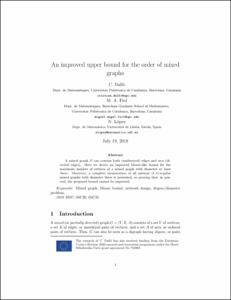 Dalfo, C., Fiol, M., López, N. An improved upper bound for the order of mixed graphs. "Discrete mathematics", Juliol 2018, vol. 341, núm. 10, p. 2872-2877.